Flashback Part 3! (And no sign of stopping.) 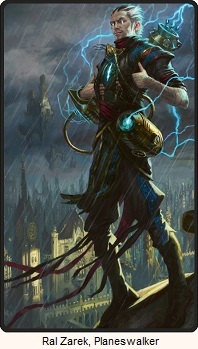 Tezzeret has a new toy, and that toy is Jace Beleren. It's time to take it for a test run. After the interview, Tezzeret and Jace have gotten down to business straight away. Jace has been finally let into the Consortium's base of operations, and together the two of them sit in an empty room, and find out what Jace can do. But first things first. Jace knows why they have need to a telepath, but he wonders why they don't have one already. Tezzeret has only heard of two others (one dead, the other unavailable) and all his attempts at artificing a device that can accomplish the same task have proved fruitless. Jace is special, and Tezzeret wants to make sure those rare talents of his don't go to waste. With that out of the way, Tezzeret asks Jace to talk to him telepathically. Jace does it just fine however Tezzeret finds out Jace hasn't really done it often and never further than a few feet away. So Tezzeret nudges him to talk to the guards from beyond the closed door, then to a guard and himself at the same time, then two guards and himself. It's at this point that Jace is pushing himself, and when asked to add one more guard, Jace nearly passes out and says he can't do it. Jace should be able to do better than that. Tezzeret expects more of him, and tells Jace that he should expect more from himself. (And that's exactly how Jace takes it. He's disappointed in disappointing Tezzeret.) He tells the guards to take him to his room and to not let him out until he can talk to at least three of them at once. Jace has grown in skill, something that thrills him to his core, but the training sessions are interrupted with long stretches of boredom. Tezzeret has an organization to run. Mr. Beleren is started to get a restless leg when one day someone comes banging on his door. The man introduces himself as Kallist Rhoka, and says they've been summoned to meet Lieutenant Paldor. They have a mission. There is a woman, Ronia Hesset. She's the head of a merchant family that does frequent business with the Consortium, often enough in fact, that she's dealt with Tezzeret himself. Lately some of their dealings haven't quite added up, which they were willing to forgive as it may be a few corrupt lowly figures here and there (and that's to be expected), but now one entire payment has been reported as stolen and the convenient moment when one of Ronia's relatives has paid off a huge debt. Their mission: Infiltrate Ronia's manor with Kallist's sword proficiency if needed, and discover what Ronia knows. Should she be innocent, report back and Paldor will take it from there. Should she be part of it, Kallist is to send a message to the rest of the household. Simple enough. Except... while Jace has always been fine with blackmail and theft, killing isn't something he's ever done. But he can't say no. There's still so much for him to learn, and of course, dire consequences if he just ups and leaves. So they're off. Half an hour to get dressed in Ronia's household livery as a disguise, and time to do some infiltrating! On the way Jace learns that Kallist isn't a planeswalker and had no magical ability. He comments that it couldn't hurt him to learn a few things, something Kallist takes seriously when he sees Jace cast an illusion of scent that throws a guard dog off their trail. As they get deeper and deeper into the manor, the two of them begin to think it's all too easy. There are some guards around, but not nearly enough. Then they make it to the bedchamber, complete with a figure laying in bed. "Ready?" Kallist breathed, barely even a whisper. There's no sign of these flashbacks stopping, which I'm perfectly fine with. This is absolutely great stuff. At this point it feels like this is the main story and the first part of the book was just the opening scene before the title credits of the rest of the show. There really isn't much more to say. 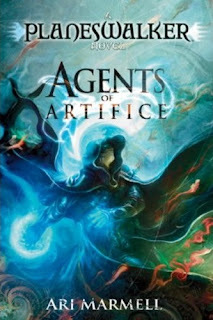 I'm looking forward to the slow corruption of innocent Jace to man we saw that used his best friend as cover. I'm looking forward to seeing the two of them actually become best friends, and looking forward to Kallist learning sorcery. I can't wait to see the introduction of Liliana Vess, the love triangle, and the betrayal. And of course the falling out with the Consortium, and what the second half of the bargain is. There's just so much to cover! 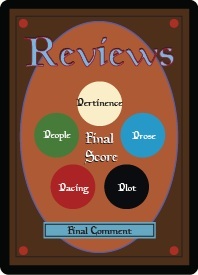 I'm glad this book was allowed to be 400 pages long rather than the 300 of most of the other recent Magic books.